Although it could have been the title of a groundbreaking LP collaboration between Tha Dogg Pound and O.G. 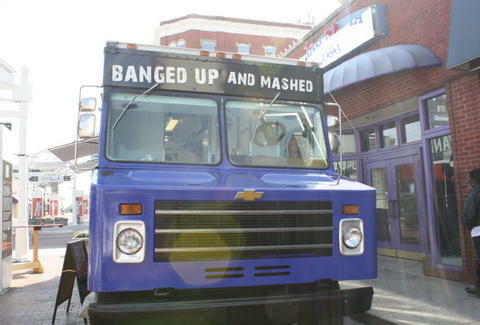 Alan Alda, Banged Up and Mashed is instead ATL's new Union Jack-wrapped British comfort food truck (which they've affectionately dubbed "Bruiser"), which’s run by a UK native, plus his partner who studied abroad in Wales and fell in love with the food, so apparently he laid off the jellied eels and cockles in vinegar. The short menu's focused on three main dishes: the signature pork sausage over mashed potatoes w/ onion gravy, beer-tempura-battered cod w/ home fries, and slow-cooked chicken tikka masala w/ basmati, since one of the owners says "what Mexican is to America, Indian is to British" -- so basically, they also don’t have any naan-trade restrictions? They also have a daily changing soup w/ Yorkshire pudding rolls for dipping purposes, add-ons such as ale-fried 'shrooms, and an in-the-works late-night that'll include a sammy they say is "like beef stew on a hoagie roll", plus cheddar-topped chips & gravy, also an Erik Estrada spinoff sitcom, in which he just beer-bongs gravy for a half-hour. Meet/eat them today at the Midtown mobile eatery meetup, tomorrow when they hit the first installment of a Friday food truck event at 14th Street Storage, and every Wednesday at Underground, which is where Alan Alda says real hip-hop comes from, and he should know from hanging around those Trappers.